Excitement was running high in my hair salon the Wednesday before Halloween. One of the stylists, Jessie, was getting married the coming Saturday: two days away. Images of big orange pumpkins, corn husks and glorious fall foliage flash into my mind. I picture the bridesmaids, dressed in pale orange dresses, walking though the field that will become the aisle, arm in arm with their grooomsmen, who wear large orange chrysanthemums in their lapels. The flower girl toddles down next, carefully distributing chrysanthemum petals along her path. And then the bride, with her parents, make their appearance to the music of the familiar, “Here comes the Bride.” It will be a sunny, brisk, fall day, and everyone will feel invigorated and happy for the young couple. I did not believe the weather forecast the day before the big event. “Becoming cloudy tonight, temperatures dropping, with snow arriving tomorrow.” Those weather casters will do anything for some extra camera time, I think. Who ever heard of snow on Halloween weekend? But by Saturday morning the headlines were “Nor‘easter is approaching our area and will bring heavy snow today. The expected accumulations will be from six to twelve inches.” My cynical policy is to ignore weather forecasts. Weathermen are usually wrong, right? I remember one Thanksgiving eons ago that brought snow, but Thanksgiving is a full month away from Halloween, and even snow that early was unusual. Unusual or not, impossible or not, the flakes started falling about 1PM on Saturday. 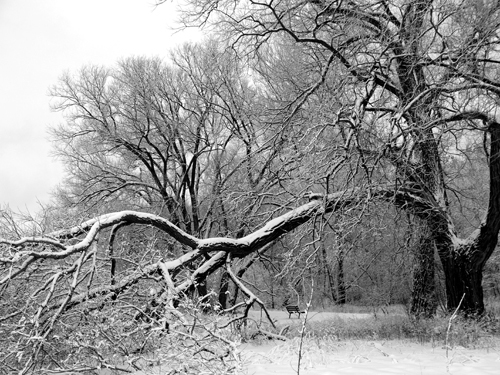 They fell harder and more forcefully, with winds bringing down tree limbs with the sickening sound of loud cracking noises as the noble trees broke and split in two. Our local roads were paralyzed. Then all power went out. We have no lights, no electricity, no heat. Just as my feelings are grim and depressing, my thoughts come to Jessie. Poor Jessie. Her wedding day is ruined. What will they do? The decorations are being destroyed by the now blinding snow and it will be impossible to continue with their plans. What size is the farm house? Large enough to move the wedding indoors? How are the roads in Pennsylvania? Will the guests be able to plow through? Will the bride and groom? I am anxiously awaiting hearing about what happened that day.